Can a Felon Get a Tattoo License? Felons may think no one will hire them after serving their sentence, but there are resources available. Many times it takes learning a new trade or starting a different career. Those who do give felons a chance find that they make good employees. For those with experience in tattooing, becoming a tattoo artist is a possibility. 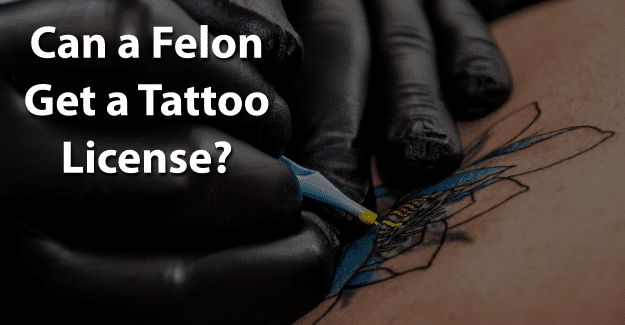 This blog post will address the issue of whether or not a felon can get a tattoo license. What is a Tattoo Artist? What is Required to Get a Tattoo License? A tattoo artist is someone who uses a needle to inject pigment or dyes into another person’s skin in order to leave permanent marks. While some tattoo artists work independently, others work in a tattoo shop. Tattooing is now legal in all 50 states. Until 2006, however, tattooing was still not allowed in Oklahoma, the final state to approve the procedure. There are laws regarding tattoos, are but in many states the individual laws are left up to the counties. Specific state tattoo laws can be found through the health department of each state. A license is issued by a state agency to practice a profession and is required in order to call oneself a licensed professional. Some states have a single license and some have a level system, and licenses, as well as requirements, vary from state to state, depending on the profession. A certification is typically a voluntary process, although certification can be mandatory or required to practice in certain states. Certification is often provided by a private organization for the purpose of providing the public protection on those individuals who have successfully met all requirements for the credential and demonstrated their ability to perform their profession competently. Tattoo businesses are required to be licensed, although this is not always the same for individual tattoo artists. Many states or counties don’t offer individual tattoo licenses, and just require businesses giving tattoos to be inspected and licensed. Typically, tattoo licensing is on the county level in each state. In some states, the tattoo artist must be licensed, but in other places he or she only needs to submit an application for a license and pay a fee. The fee has to be paid regardless of whether or not the license is approved. In most areas, especially the medical field, anything that involves meals, blood, plasma, and permanent body modifications are strictly controlled by the government. Bloodborne pathogens like hepatitis B, hepatitis C, and HIV/AIDS can be transmitted by a tattoo needle that has been used on another individual. Additionally, ink can harbor a virus or bacteria when the ink is used repeatedly. Dirty surfaces and unwashed hands can create potential infections. Infection. If equipment is not properly sterilized and a person is a high risk for serious viral infections, infections can occur. Bad tattoos. Using homemade equipment instead of professionally-produced tattoo equipment can put the ink too far below the surface of the skin or can leave scarring with potential infection. Unsafe ink. Almost any colored liquid can be injected into the skin and made to look like a tattoo. Not only will it not have a good appearance, it can potentially poison someone. In some states, the Drugs and Medical Devices Group is responsible for conducting on-site inspections of tattoo locations. This ensures that tattoo parlors comply with state and local laws and regulations, complying with safety and health codes along with any local laws. He or she may not work from home but must operate from a separate tattoo parlor, and the location must have a license. The tattoo artist is required to report any diseases, infections, or allergic reactions to the state health department. The tattoo artist must keep a record of each individual’s identity, date of visit, and type of tattoo in a log book. The building must be clean and well-maintained. The tattoo artist has to use precautions to prevent the spread of infection. This includes washing hands with a germicidal soap, wearing clean clothing and using each pair of gloves only once, using personal protective equipment, using instruments that are disposable or routinely sterilized, and follow proper handling procedures in regards to the disposing of waste. There are sterilization records that show routine sterilization practices. The artist is prohibited from the tattooing of minors unless all conditions are met. Any tattoo artist who does not comply with these requirements established by the state health and safety code can face criminal and civil fines. Criminal penalties are punished as Class A misdemeanors and they have serious fines or even a prison sentence. This is especially troublesome for felons trying to regain a place in society. Failing to comply with any state licensing and safety regulations may lead to a license being revoked. Taking and passing a bloodborne pathogen course approved by that state’s health department. With the lack of formal regulations for licensing, being able to work as a tattoo artist will depend mainly on finding a licensed tattoo artist or at least one with a licensed tattoo parlor who is willing to give a felon an opportunity. Many felons have experience with tattooing from their time in prison, either receiving or giving tattoos. This would help make them good candidates for more extensive training in acquiring a tattoo license and working as a tattoo artist. In order to be successful in their pursuit of getting a tattoo license and a job as a tattooist, it is essential for felons to be honest about their background. They are already working with the negative perceptions of being dishonest, untrustworthy, and unwilling or unable to follow directions from authority figures. There are re-entry programs, such as drug treatment, and educational opportunities for felons who need them. For many felons, having their felony expunged can give them the chance they need to begin with a clean record and succeed in getting a tattoo license. Having their record expunged will permit a felon to be able to honestly state on an application that he or she has not been convicted of a felony and increase the chances of success. It is a significant challenge, but it might be worth it for a felon that wants to get a tattoo license. Having his or her record expunged and also documenting any training programs or additional education could make the essential difference in a felon succeeding. What do you think about this blog post? Have you or someone you know been in the situation of trying to get a tattoo license with a felony? What was that like for him or her, and how did he or she achieve success? Please tell us in the comments below.